The staff of the Wyndham Robertson Library is deftly managing the challenges faced by students and faculty in the digital age by embracing customer service with a 21st-century sensibility. Three years ago, researchers from the University of Southern California determined that the average person receives five times more information than he or she did in 1986—every single day. As this barrage of data from the Internet, smartphones, and other technological advances continues unabated, Wyndham Robertson Library is purposefully seizing upon the worldwide digital revolution as a 21st-century rallying call, shifting its focus as an academic library from gatekeeper to guide. 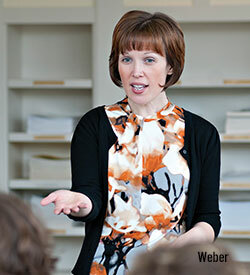 For faculty members such as Professor of Classical Studies Christina Salowey and Associate Professor of Communication Studies Jill Weber, the library’s transition from collection centered to student centered is a godsend. Each spring, the library celebrates exceptional student research projects completed in Hollins courses by presenting the Wyndham Robertson Library Undergraduate Research Awards. According to the awards’ Web page, “These research projects showcase extensive and creative usage of the library’s resources; the ability to synthesize those resources in completing the project; and growth in the student’s research skills.” This year’s winner was Catherine Hensly ’14 for her paper, “Higher Education, Higher Costs: An Income-Contingent Approach” (see photo). 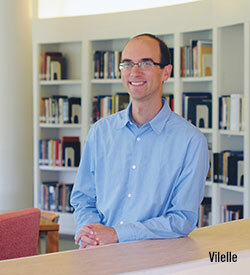 While remaining cognizant of the pitfalls of the digital age, Vilelle says the library is constantly exploring ways in which it can maximize some of the advantages of new technology. “The library website is never going to be Google, but we’re trying to create as many easy ‘ins’ to our content as possible. We recently did a redesign of our homepage. We used to just have a catalog search. Now we’ve got tabs at the top where you can not only do that but also search all the roughly 30 EBSCO online research databases we provide and all our JSTOR content [a digital library of academic books, journals, and primary sources]. We’ve also had a chat box on our homepage for a number of years where students can talk with us and ask us questions.” A text messaging service and an app that will allow people to access the library and even perform in-depth research from their mobile devices are forthcoming. Catherine Hensly ’14, a double major in economics and business, won the library’s top Undergraduate Research Award this year. “Higher Education, Higher Cost: An Income-Contingent Approach” also won the Virginia Social Science Association’s Best 2014 Undergraduate Paper Award. You may have graduated from Hollins, but you’re still welcome to use many of the library’s services as outlined below. Alumnae/i now have access to JSTOR and Project MUSE, two of the library’s largest online collections of journals. To use these databases, you must have a user ID and password. Contact the alumnae office (alumnae@hollins.edu or 800-TINKER1) to get your log-in information. All alumnae/i are welcome to search the online catalog for books and films, and to use the periodicals and government documents within the library. A library card (free to alumnae/i) is required to check out materials for use outside the building. Register for your card at the library’s first-floor circulation desk. Our reference staff members are ready to help you with quick questions or more extensive research consultations. IM us. On AIM, Yahoo, Google Talk or MSN, we are askwyndham; or use the box on our homepage. 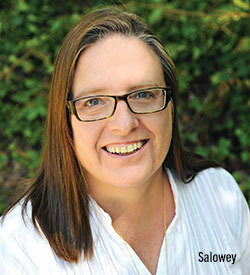 Faculty and alumnae/i publications are located in the Hollins Room, third floor. Our manuscript collections include literary and personal papers of faculty, alumnae/i, and other individuals. Visit the library’s page for alumnae/i.